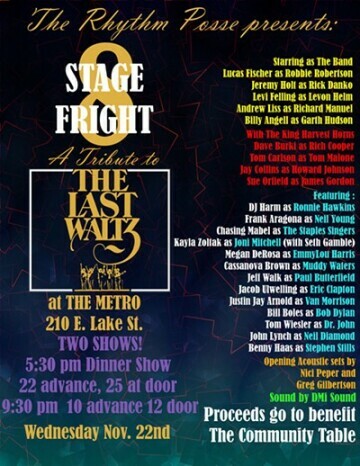 The Rhythm Posse, along with 25 of their musician friends are once again putting on Stage Fright. 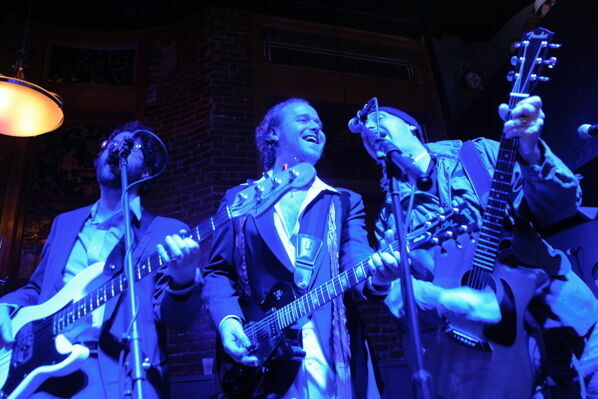 Now in it's eighth year, the show is a recreation of the 1976 concert film "The Last Waltz", with The Posse as The Band, and many local musicians filling the roles of iconic 70's stars such as Eric Clapton, Bob Dylan, Neil Young, Joni Mitchell, Van Morrison and more. This year there are doing two shows on the same night, a dinner show, and a late show. Dinner will be buffet style and will include a selection of pizzas, pastas, salads and desserts. Small plates will be available for purchase during the late show. Again this year, the money we raise will be going to benefit The Community Table.